The Blog of CF Photography: Time To Step it Up! Hi all you in Blog land. I am afraid I have been a bit off the pace. I just wanted to FYI all of you that I will have about 5 post coming today till Saturday so please keep ck'n in to see what I've been cook'n. Thanks for all you viewing and patients over the last few weeks. 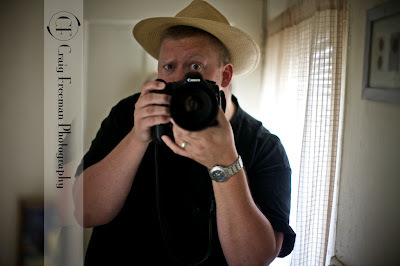 Yes, that is me with the famous 50mm 1.2L in a self portrait. Cool hat huh!